Thanks to the unprecedented availability of minor league statistics, video, and player rankings, baseball fans are far more informed about prospects today than at any point in the past. And now that fans know what they’re missing, they’re also more impatient for those prospects to arrive. For cellar dwellers like the Cubs and the Astros, who’ve dismantled their major league rosters to assemble strong farm systems, prospects are the opiate of the long-suffering supporter; they’re the embodiment of a bright future that makes losing in the present tolerable. While that sense of anticipation and unfettered possibility makes following minor leaguers fun, however, the best prospects eventually progress to the point where fans can no longer get a satisfactory fix by locking the door, setting Chrome to “Incognito,” and scouring minor league box scores. The real payoff comes only when the player earns a promotion to the majors, and Twitter hath no fury like a fan whose favorite prospect is producing in the upper minors more than a month into the season but still hasn’t gotten the call. Under the current collectively bargained system, however, teams have strong incentives not to promote their prospects the moment the stats and scouting reports say they’re ready. The CBA binds each player to his organization for his first six full seasons of big-league service time, the final three of which are subject to salary arbitration. When a player makes the majors, his service clock starts counting down toward the end of team control, so clubs do what they can to postpone that day for as long as possible. There are two ways in which teams try to delay a player’s big payday by timing his promotion just right (or just wrong, from the player’s perspective). To accrue a full year of service time, a player has to spend 172 days on the active roster. A baseball season typically runs about 183 days, which means that clubs can extend their grasp over players for an additional year by keeping them in the minors just long enough to prevent them from reaching 172 days of service as rookies. This explains why we sometimes see mid-to-late-April promotions, such as Evan Longoria’s in 2008 or George Springer’s (possibly premature) arrival earlier this season. Then there’s the “Super Two” system, which makes the players who fall into the top 22 percent in service time among those with between two and three years of big league experience eligible for arbitration ahead of schedule. “Super Two” players get to go through the arbitration process four times before reaching free agency instead of the usual three, which means they make more than the MLB minimum a year earlier and give their agents a higher contract base camp from which to eventually launch an assault on the summit. To avoid making their prospects Super Twos, teams try to estimate when it will be safe to summon them without putting them into the top 22 percent, often aiming for mid-June. Like fans, teams have gained an appreciation for the importance of young talent, and the steps they’ve taken over the past 15 years to ensure they don’t waste any of those precious pre-arbitration innings or plate appearances have fundamentally altered baseball’s aging curve. Although the financial benefits of micromanaging call-ups can be considerable, teams run a real risk by letting weeks or months go by before putting their top talent on the field. In 2011, Tampa Bay Rays left fielders other than Desmond Jennings hit .246/.302/.392, but the Rays waited until July 23 to call up Jennings, their top hitting prospect at the time. Jennings hit .259/.356/.449, a vast improvement over his predecessors, and Tampa Bay won the wild card by one game. Last year the Rays repeated the feat, waiting until June 18 to promote top prospect Wil Myers — who went on to win American League Rookie of the Year — and needing to beat Texas in a tiebreaker to claim a wild-card spot. For the Rays, who don’t draw well even when they win, the salary savings these delays generate are significant. Still, the club is playing a dangerous game. Twice in the last three seasons, only luck or impeccable timing has saved Tampa Bay from putting service time ahead of a playoff appearance. 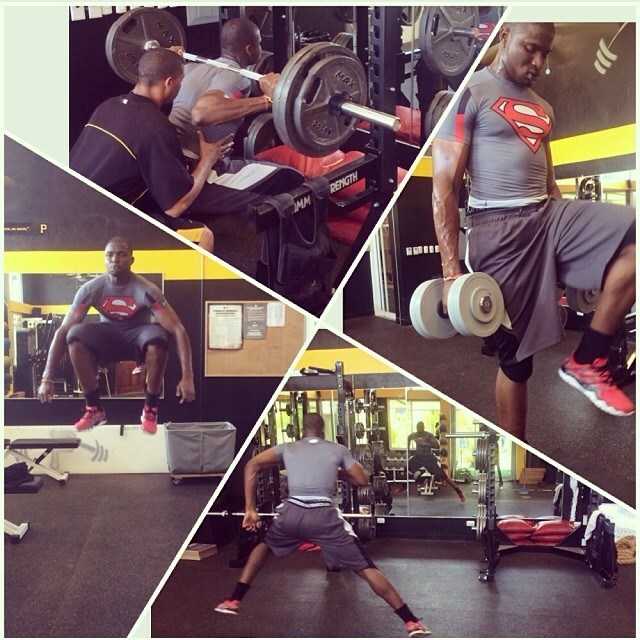 The latest flash point in the service-time saga is 22-year-old Pirates outfield prospect Gregory Polanco, a 6-foot-4, five-tool Superman who most preseason publications picked as Pittsburgh’s top prospect. Polanco has hit .395/.444/.613 in 31 games for Triple-A Indianapolis; meanwhile, in the majors, Pirates right fielders (primarily Jose Tabata and Travis Snider) have combined to bat .229/.294/.329. With the Pirates off to a 14-20 start and their odds of returning to the playoffs dwindling by the day, fans have understandably begun to call for the cavalry. The Pirates know what kind of impact Polanco is capable of making: They reportedly offered him a multiyear contract this spring, which he rejected. If he’d accepted, service time would no longer be a concern. Since it is a concern, however, Pirates GM Neal Huntington finds himself fielding constant questions about Polanco’s potential arrival, insisting that Super Two worries aren’t a “driving factor,” and saying that Polanco is still “refining some intricacies,” while somewhat suspiciously refusing to specify what those intricacies actually are. While almost any 22-year-old could stand to smooth out some rough edges, the same goes for Tabata and Snider, whose experience hasn’t helped them produce. But while Polanco’s delayed arrival might agitate fans, it shouldn’t surprise them: In recent seasons, the Pirates called up Andrew McCutchen, Pedro Alvarez, and Gerrit Cole between June 4 and June 16, so unless Polanco’s play (or Snider’s and Tabata’s) forces Huntington’s hand sooner, Pittsburgh’s top prospect can look forward to another month in the minors. Not every team shares the Tampa Bay/Pittsburgh philosophy, however. Last month, Baseball Prospectus author Zachary Levine studied the recent history of top-prospect promotions, tracking down the debut of each player who BP rated as a team’s top prospect from 2007 to 2013. 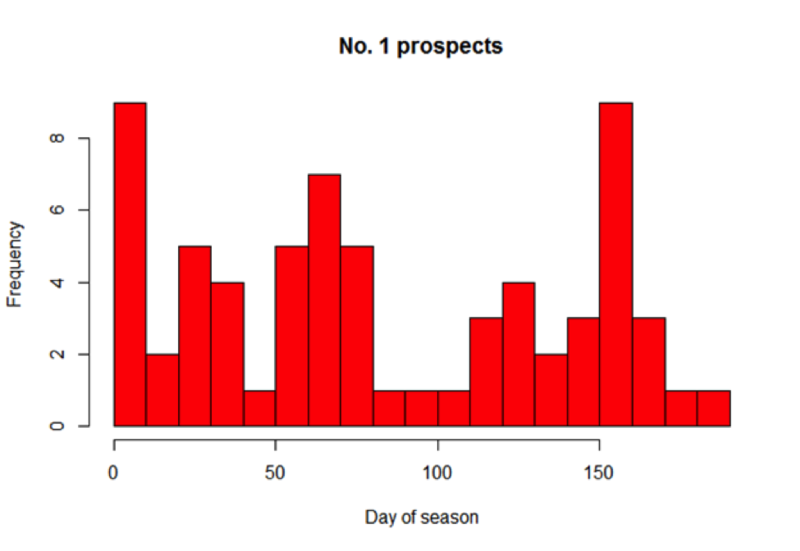 He charted those debut dates in the graph below, where each red bar represents a 10-day block of the regular season. The higher the bar, the more top prospects who were promoted during that period. As expected, we see taller bars at times that correspond with major service-time milestones: days 20–30, the Late-April Delayed Free Agency Area, and days 60–90, the Super Two Safety Zone. We also see an uptick in the 120–130 range, when the trade deadline creates openings that prospects can fill, and a big spike at the start of September, when rosters expand. But what about that big bump right at the beginning? Over the past seven years, nine prospects who ranked at the top of a BP team prospect list debuted on Opening Day. Of those nine, five (Alex Gordon, Rick Porcello, Jenrry Mejia, Michael Pineda, and Brandon Belt) subsequently spent enough time in the minors to give their team an extra season of service time anyway. One of the remaining quartet, John Danks, signed an extension to stay with the White Sox; another, Colby Rasmus, was traded from St. Louis to Toronto and will be a free agent this winter if the Blue Jays don’t sign him to an extension. The other top prospects who made Opening Day debuts, Jason Heyward and Jose Fernandez, have become two of baseball’s most exciting young players. So why did the Braves and the Marlins, respectively, decide to get aggressive in the short term rather than hold Heyward and Fernandez back to maximize their service time with the team, and what can other teams learn from those decisions? Heyward was only 20 years old in the spring of 2010, but the former first-round draft pick was coming off a season in which he’d climbed two minor league levels, reached Triple-A, and finished with a .323/.408/.555 overall line, for which he was named the organization’s (and Baseball America’s) minor league player of the year. He hit .305/.423/.424 in 59 spring training at-bats, denting cars more than 400 feet from home plate. There was no doubt he was ready for the Braves, but it wasn’t a certainty they were ready for him. This was well before plans for a new ballpark deepened the franchise’s pockets, and at the time Atlanta’s payroll fell right in the middle of the pack. According to Braves GM Frank Wren, though, service time wasn’t even a consideration. 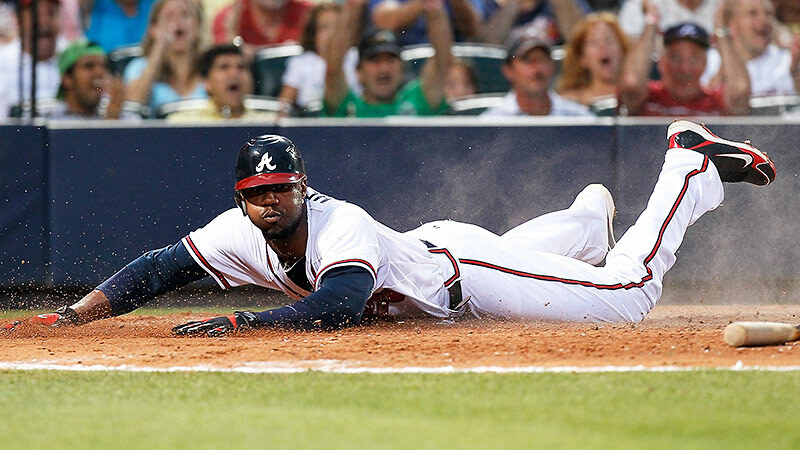 The 2010 Braves, like the 2011 and 2013 Rays, won the wild card by one game, and Heyward was their second-best player behind Brian McCann, amassing 5.1 Wins Above Replacement Player and finishing just behind Buster Posey in the NL Rookie of the Year race. In retrospect, Wren’s decision seems prescient, since even waiting until late April could have cost the Braves the game that ultimately separated them from the Padres. The 2013 Marlins knew they wouldn’t be competitive following a barrage of trades at the 2012 deadline and during the offseason, yet when it came time to determine their top prospect’s fate, they didn’t make a different decision. Fernandez, like Heyward in 2010, was 20 years old when he debuted, and he was Miami’s reigning minor league pitcher of the year. Unlike Heyward, though, Fernandez hadn’t even made it to Double-A, and because of his inexperience, the original plan was to send him down for more seasoning. Shortly after the Marlins optioned Fernandez on March 13, however, they faced an injury stack in the starting rotation, with Jacob Turner, Nate Eovaldi, and Henderson Alvarez all suffering setbacks. “So, service time wasn’t the biggest part of the discussion,” Hill says. In the young ace’s first major league start, he struck out eight and allowed one run in five innings against the Mets, and in his next outing, he held the Phillies scoreless for six. The Marlins quickly ceased worrying about that ticking team-control clock, but they remained concerned about Fernandez’s lack of experience. It quickly became clear that only opposing hitters had anything to fear from the young right-hander, who finished third in the NL Cy Young race. Still, remember what team we’re talking about. After owner Jeffrey Loria’s latest fire sale, the Marlins had baseball’s second-lowest payroll. Since they weren’t going to win enough games for one or two more to make a difference, why wouldn’t they want to delay Fernandez’s arrival for the few weeks it would have taken to push back his free agency to 2019? “Historically, we’ve never been afraid to push young players, and we’ve never been afraid to pay a premium when they become Super Twos, because given our situation, we have to have our talent perform at the major league level,” Hill says. In other words, one of the teams that would theoretically stand to benefit the most from gaming the service-time system paradoxically can’t (or won’t) afford to do so. Miami needs production from players who are making the league minimum, and when those players are homegrown and reasonably ready, they’re thrown into the fire. Fernandez, like Willis, Miguel Cabrera, and Giancarlo Stanton before him, proved totally flame-retardant, and for now, he’s giving Miami surplus value in spades. Eventually, though, he too might find himself on the trading block, and if so, he won’t bring back the package he would have if he’d come with another year of team control. Maybe the Marlins haven’t learned that resisting one marshmallow now might mean two marshmallows later. If you’re thinking that Wren and Hill could have calculated the impact of injury risk, attendance, TV ratings, or merchandise sales and done a complicated cost-benefit analysis to determine whether those factors would outweigh the cost of paying (or losing) a potential franchise player sooner, you can abandon the idea. “None of us are that smart,” Wren says. Nor does either have any regrets about calling up his team’s top prospect on Opening Day, even though Heyward is due to hit the open market after the 2015 season and the Marlins now look like they’ll need Fernandez more in 2019 than they did in 2013. Many teams have made, and continue to make, a different decision than Wren and Hill did with Heyward and Fernandez, respectively. In some cases, that decision is dictated by ownership; in others, it stems from a club’s position on the win curve, a lack of holes at the major league level, or legitimate fears about a prospect’s preparedness. Sometimes, it’s merely a matter of delaying immediate gratification for the good of the team in the long term. As long as the Super Two system remains in place, some teams have legitimate reasons to drag their feet with ripe players like Polanco, Oscar Taveras, and Jonathan Singleton. But even in these days of unprecedented general manager job security, a GM who costs his team a playoff appearance by neglecting an in-house option could face bigger problems than Twitter complaints from prospect hounds. Why Are We Doing This in May?